The Corvette Stingray has a pedigree that goes back to 1953 when Chevrolet introduced the first of its kind. It has always been a beast, but the Corvette Stingray Z06 2017 edition lives and breathes in a world of rare air. The Corvette Stingray Z06 takes the Corvette tradition to the next level primarily because it developed as an adjunct to a race car. The rigid, super-light aluminum space frame is a speed demon’s dream and the aluminum 6.2L V8 engine rates at both 650 horsepower and 650 pound-feet of torque. That’s the essence of wild animal spirit embodied in a manmade machine. The original Corvette, introduced at the GM Motorama as a concept car in 1953, was an ordinary Chevrolet chassis with a V6 engine and a slick, sporty, super-cool fiberglass body. It went from 0-60 in a sedate 12.5 seconds. The moniker Sting Ray first appeared in 1963, but by now the Corvette was powered by a 396 cubic inch V8 engine with 360 horses under the hood. Corvette Sting Rays were retitled Corvettes in the 1970s, though people still referred to them as Sting Rays or Stingrays. Both spellings were used in different years but from 1978 to 2014 they were officially labeled Corvettes. In 2014, GM brought back the Corvette as the Stingray; the Corvette Stingray Z06 of 2017 was developed concurrently with the C7.R racing vehicle. It is officially considered part of the seventh generation of Corvettes. 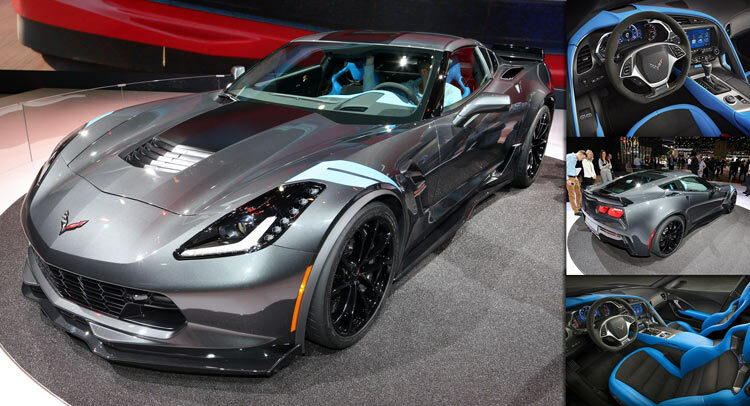 The Corvette Stingray Z06 and the C7.R are fraternal twins that have many common traits and parts that include chassis structure, powerplant technology, and aerodynamic creativity. The Stingray is the archetype for both the professional and amateur versions of this exceedingly fast machine. The Corvette Stingray Z06 breaks the envelope of high-performance expectations. The LT4 supercharged 6.2L aluminum V8 engine delivers 650 horsepower and 650 lb.-ft. of torque. Transmissions come in several options, along with Active Fuel Management™, Direct Injection, and Continuously Variable Valve Timing. The Corvette Stingray Z06 provides primitive, mindboggling force with hypermodern, 21st-century efficiency. The Corvette Stingray Z06 Performance Package includes cutting-edge suspension tuning along with Brembo® 15.6″/15.3″ carbon-ceramic brake rotors. It’s all about performance. These features help you grab the road with maximum speed while offering the peace of mind of the most dependable braking system available. The standard package includes Michelin® Pilot® Sport Cup 2 ZP summer-only tires. The message is clear. You can push this car safely on the wildest hairpin turns but not in the winter. The Corvette Stingray Z06 also comes with an optional wicker bill, the most advanced design on the market. For those who may not know the term, it is “The Gurney flap…a small tab projecting from the trailing edge of a wing. Typically it is set at a right angle to the pressure side surface of the airfoil and projects 1% to 2% of the wing chord.” (Wikipedia) This car would fly if it could, but the adjustable, transparent wicker bill produces variable amounts of downforce that give the Corvette Stingray Z06 the highest level of aerodynamic road-hugging downforce of any GM car ever marketed to the public. It is adjustable only by hand and provides more than three hundred pounds of downforce. Another feature is the performance driver mode dial that provides five discrete driver options, electronically calibrated to generate up to 12 performance variables. This allows the driver to customize her vehicle for any imaginable road conditions. Speed and safety work hand in hand with the engineering of the Corvette Stingray Z06; the more dependable your security features, the faster you can go. Here are some other safety features: Active Handling, 4-wheel antilock brakes, and standard Xenon high-intensity discharge headlamps. The Xenon lights produce 900 lumens of illumination, turning night into day. Another standard feature is the run-flat tires that keep you slow and safe on the road until you reach a service center. Seat-mounted head and thorax airbags are state-of-the-art accident features combined with a rigid aluminum frame, the strongest structural support of any Corvette model ever. The Ron Fellows Performance Driving School offers a two-day driving program tailored to the Corvette Stingray Z06. This invaluable course combines classroom instruction with supervised driving time on the Spring Mountain road course. If you want to discover the limits of your new Corvette and of your own driving skills the Ron Fellows Performance Driving School is ideal. You can also take delivery of your brand new Corvette Stingray Z06 at the National Corvette Museum. Every Corvette owner becomes part of Corvette history. Some things are priceless. The Performance Data Recorder records video of your excursions onto an SD memory card. This includes driving data in real time so that you can advance your road techniques through analytical study. Another option is the Valet Mode, a feature which speaks for itself. If you must use valet parking for any reason, Valet Mode records images and data for those times when you suspect that somebody took a thrill ride. The Corvette Stingray Z06 can be purchased either as a convertible or a coupe. You also have the option of an automatic transmission, though most sports car drivers clearly prefer the standard gear shift. There are many color schemes, seat options, and media options. One thing you can’t complain is the lack of choices to make. The Corvette Stingray Z06, part of the seventh generation of Corvettes, continues the history of this iconic vehicle. Just think about going from 0-60 in 3.7 seconds: the true meaning of beast mode.